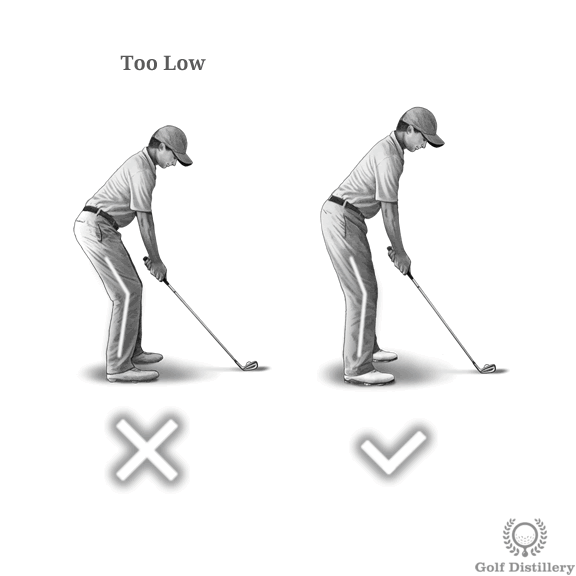 The amount of flex to set in your knees represents another key aspect of a proper golf setup. Indeed, making an error here will translate to further errors down the line. As with a lot of things in golf, ideally you’ll settle for the middle ground. At one end of the spectrum you will find golfers who bend their knees too much. Rather than allowing a small but definitive knee bend, these golfers will drop much lower to the ground than they need to. In doing so, they will bring their knees close to their hands, which they will need to extend out in order for the two to avoid being on a collision course. 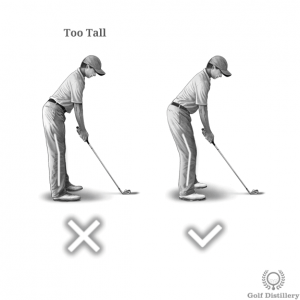 Most of the times, knees that are allowed to bend too much will result in the weight of the golfer to be positioned towards the back of the feet rather than be squarely in the middle. Another issue that stems from this position is that it gives way to a lot of variance in the knee flex from the moment the golfer is at address to the moment he finally returns to the ball at impact. Indeed, in the many sequences of movements between those two critical moments the knee flex can vary significantly, so much so that it becomes difficult to control and to precisely dial in. 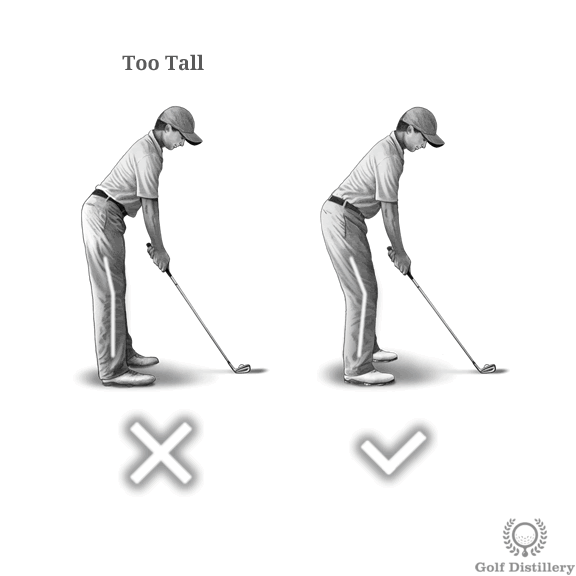 So a golfer with a lot of knee flex can suffer from the standing up at impact swing error. At the other end of the spectrum you will find golfers who barely bend their knees at all. Rather than adopting more of an athletic position that a golf swing requires these golfers will seem to almost be standing up in front of the ball. One of the issues that arise with this setup is that it tends to move the weight towards the toes, instead of towards the middle of the feet. The main benefit to this approach is that there is very little variance that is permitted in the flex, which will help you stay level as you perform your swing. 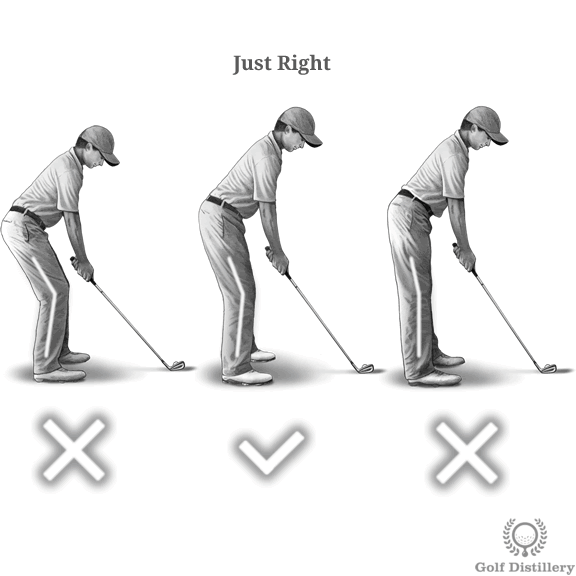 Indeed, granted that you refrain from dropping during your backswing you should be able to return to an effective position at impact and one whose knee flex resembles the one you had at address. Finally, golfers who stand tall at address often do so in order to protect themselves from fat shots. Adopting such a position puts them as far from the ball as their knee position alone will allow. On the flip side, these golfers are at a heightened risk of thinning shots. Finally, the ideal setup is found in between these two extremes in what can be described as an athletic position. Indeed, at address you should have your knees flexed a little which in combination with your spine angle will have the bulk of your weight residing in the middle of your feet. Your hands will be hanging loose down your arms which will be perpendicular to the ground, all the while providing plenty of room between your knees and your hands. The benefit of using such a position is that it is quite stable, enabling you to remain in perfect balance as you perform your golf swing. It is also easy to replicate over and over again, a crucial component in your quest for swing consistency.